It is fitting that Tokyo Olympiad is screening as part of the Japan Society and Museum of Modern Art’s series Kazuo Miyagawa: Japan’s Greatest Cinematographer because Miyagawa’s images are the whole film. 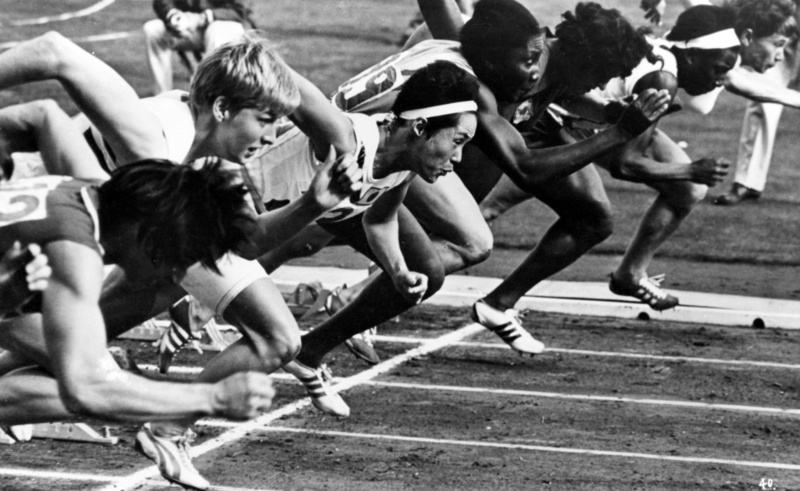 Directed by Kon Ichikawa, this record of the 1964 Summer Games is considered one of the best sports films ever made. It’s a you are there sort of film that is full of mood and sense of place that most other films are lacking. Its’s due entirely to Miyagawa’s photography which put us into the action in an up close and personal manner. My personal reaction to the film is mixed. While I love the images, I find the pacing a bit too slow for my tastes. While I’ve seen the film numerous times, and being able to own it on Blu-ray was one of the reason I bought the Criterion Olympic film box, I find that I end up watching the film in pieces more than straight through. I’ll watch it until my interest flags and stop for a bit and then come back. This is not a knock on the film more a statement of my own viewing preferences. Frankly if you’ve never seen the film you need to go to MOMA and see the film on a big screen. This is a film that needs to be seen as big as possible. It’s such a requirement that despite the screening at Japan Society and MOMA conflicting with the Tribeca film festival I’m seriously considering going uptown to see it on a big screen under optimal conditions. And the optimal conditions should be a big reason to go since it hasn’t always been easy to see complete. Originally it had to be cut to 93 minutes when the Japanese government balked at its artistic 170 minute run time. Even after the full version was released in 1984, the Olympic committee put the film out on You Tube in a truncated 125 minute version. Lately the DVD release from Criterion has gone in and out of print with it now being available in a pricey, but wonderful, collection of Olympic films. If you love gloriously shot films you must go.